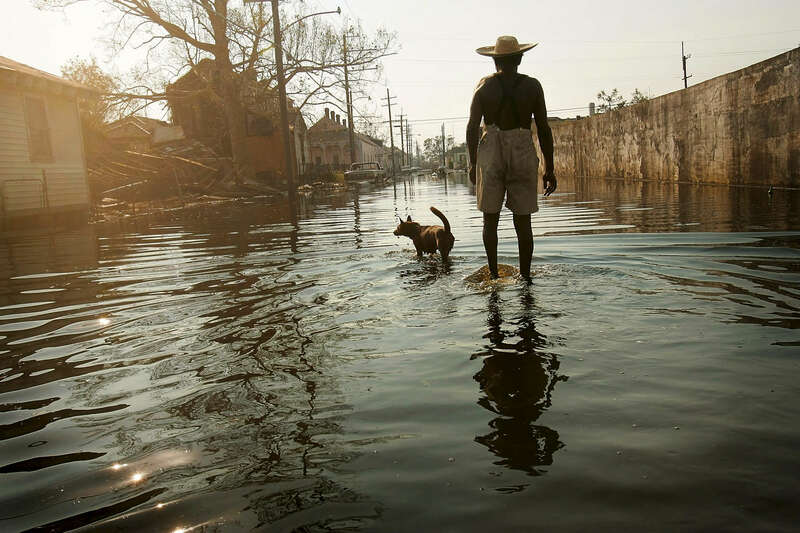 9/4/05 -- New Orleans, Louisiana -- 9th Ward -- Paul Garrett, 56, and his neighbor's dog, Rusty, whom he rescued during Hurricane Kartina, walk the streets of the 9th ward on their way home. "Everybody left," said Garrett, a former longshoreman. "I stayed." Garrett said he stayed to help the neighborhood's elderly and sick. "Everybody can't leave," he said. "I'm lookin' [sic] out for people who can't help themselves. Especially the older people. See, I'm just a 'junior citizen.' They're 'senior citizens'," he continued. "You got a lot of people in this city who don't care for each other. I feel like we should pull together now instead of apart. It's gotten worse. It's not right," he said. Photo by Dina Rudick, Globe Staff.